Sometimes you read a book and while you don’t always agree with everything and maybe not even “like” the protagonist, there’s something about the book that sticks with you and makes an impact. For me, that book at the moment is Ray Dalio’s “Principles”. The book offers so many sharp insights into how to improve your thinking and become capable of higher performance that it’s hard to take in during the first read. It is literally a massive book – I have the Audible version and it’s nearly 14 hours! But it is jammed packed with amazingly different ways of considering how to solve problems and achieve high levels of success over a prolonged period of time. Let me be clear, I’m not a huge Ray Dalio fan. I find him arrogant and I think for all of his brilliance, he’s been one of the people that have contributed significantly to the precarious state of our overly engineered financial markets.Putting all that aside, the way he thinks about things is different than just about anyone I’ve ever come across and you simply can’t question his success. The logic behind his way of thinking, when he can get everyone to buy in, is flawless. One idea that I’ve taken away from reading “Principles” is the idea of “radical transparency”. Dalio believes that to have an idea-based meritocracy you have to have “radical truth” and “radical transparency”. You have to operate on the basis that good ideas can come from all quarters and that to ensure those good ideas surface people need to be able to be completely honest with each other (arguing the “truth”) and everyone needs access to all of the data so that they can make informed decisions. It’s worked for his company, Bridgewater Associates, so there’s something to it. For me, I think small business owners aren’t really radically transparent with themselves enough – we all hide the truth to some degree from ourselves. We focus on the things that we are either interested in or that pull on a certain part of our personality. With some people, those focal points are the negative parts of their business. This could be as simple as the things that the owner doesn’t think are working properly or it could be more insidious and be a lack of self-confidence the owner has in themselves being reflected onto the business. For other people, they might just focus on the things that are performing well or the stuff they like doing – I often refer to this as playing the fiddle while Rome burns. These people like to dive deep into the fun bits while ignoring the existence of the things that aren’t firing on all cylinders. This is where I think radical transparency comes in. I was disappointed in myself and my own performance last year in the Casual Marketer business – I felt that I didn’t push myself hard enough. After reading Dalio’s book, I came to a landing that it was simply a lack of transparency – I didn’t clearly articulate to myself what I wanted to achieve and I didn’t have the data and evidence to measure whether or not I was doing a good job. This year, I’ve fixed that. The first thing I did in 2018 was setup some metrics and KPIs for myself that are directly aligned with the things that I need to do to be successful. Again, my philosophy about business holds true – financial success is a byproduct of following a process that ensures you’re doing the right things consistently. To be radically transparent, I decided to set some benchmarks and targets for myself to measure those things and make sure that I actually was consistently doing those things right. Someone asked me if I was going to share those to hold myself accountable and I said that I wasn’t because I don’t need an “accountability crutch”. I’m an adult, if I commit myself to something and I want to achieve it, I should put in the work to get there. The only thing I need is to be honest with myself and so this dashboard of metrics and KPIs is like my truth serum. There are no soft and fuzzy things on there – I punch in trackable numbers once a month and it spits out graphs – pretty simple. The graphs have trendlines so that I can see where I’m at against target at all times. It’s just me and the dashboard – the truth is there in all of its radical transparency glory. I will say that it’s been invigorating so far. My numbers are monthly numbers but I run through the exercise at least once a week where I update the January portion with the month to date. I can see some numbers are trending in the right direction, most are exactly where I expected them to be and the odd one has gone the wrong way. In fact, it’s forced me to become more aggressive in some of my activities because the numbers indicated a negative trend and when I thought about why, I knew that I wasn’t doing enough to execute in that area. You could say the answer was transparent. Try it out – sit down for a couple hours and pull the covers back on your business. 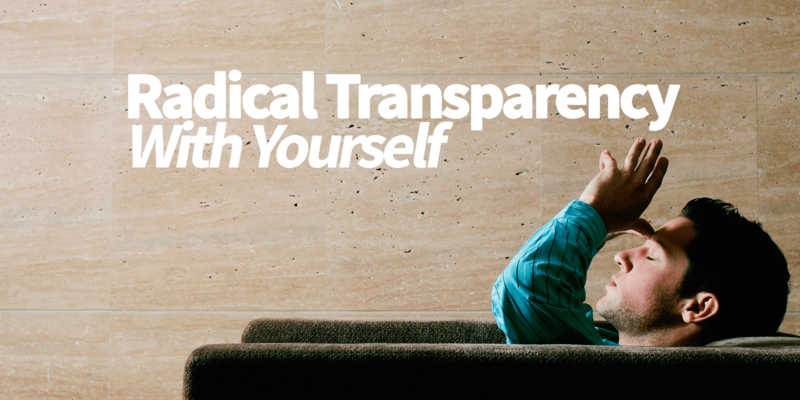 Be brutally honest with yourself and figure out do you have as much visibility and transparency as you should have? If not, why not? And better still, how do you get that? If you’re just bumbling along fooling yourself, the only fool at the end of the day is you.